Did you snag that incredible deal on Prime Day for an Instant Pot? I did and have been cooking at least once a day in it since it arrived. 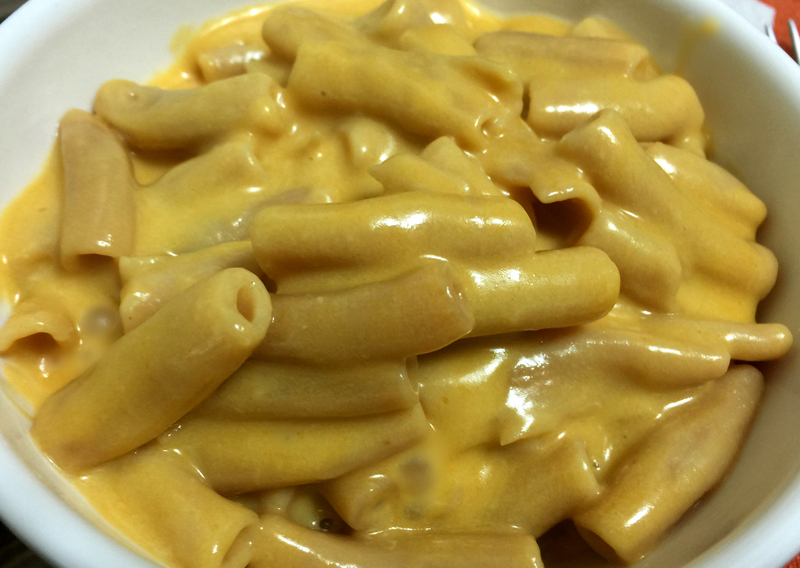 Today I’m sharing my recipe for Instant Pot Macaroni & Cheese, gluten-free of course. It’s also grain-free and there is a dairy-free option. A few folks have asked me what the Instant Pot is and what the big deal is about it. It’s an electric pressure cooker. It has a digital control panel and is programmable. Beyond functioning like a pressure cooker, it also works as a slow cooker, a yogurt maker, rice cooker, steamer, saute pan…. It’s really the best new kitchen gadget I’ve added in a long time. It’s right up there with adding a fancy blender! The skinny on this: I’ve been cooking things in 20% of the time it took before and I don’t have to stand at the stove and stir. It’s a huge time savings for me and so simple. A friend who recently got one, too, said she cooked a pot roast in an hour. I’ve been cooking grits in 15 minutes. This used to take me well over an hour and I would have to stir frequently. Now I put them in the cooker and walk away until it’s done. It’s that simple. I’ve been cooking jackfruit in it for burritos, tacos, BBQ sandwiches and more. I used to prefer slow cooking jackfruit but now can make it in 30 minutes. Oh, and hardboiled eggs! For those of you who raise chickens or buy farm fresh eggs, you know it is a challenge to peel hardboiled eggs. Not in the Instant Pot. 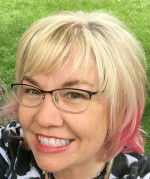 I had asked my friend Megan of Allergy Free Alaska a million questions about the Instant Pot before taking the plunge and buying one; now I don’t know why I was waiting! And just like that, I feel like I’m on an infomercial. I know it may sound silly, but wait until you experience the Instant Pot! I’m so excited about it and can’t wait to share even more recipes with you. I’m working hard on testing recipes right now, learning all of the possibilities and how to coax the best meals from this gadget that I put off buying for too long. 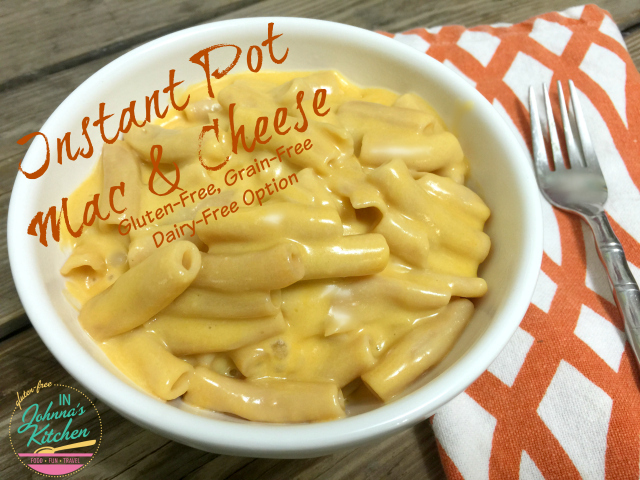 Let’s get started with my Instant Pot Macaroni & Cheese, gluten-free, grain-free and with a dairy-free option. Less than 20 minutes to homemade mac ‘n cheese with only 5 minutes of it being active cooking time. The rest is just sit-and-wait time, browse-facebook-and-instagram time, unload-and-reload-the-dishwasher time. Click below for the recipe…. I have to give an instant pot a try! I really drug my feet about buying one. I’m always trying to reduce how many kitchen gadgets and appliances I have. But when the Prime Day price was under $70, I jumped in. Now I’m wishing I would have bought it much earlier, even at full price. I’ve used it every day since it was delivered! I have got to try Banza after all the wonderful things I have heard. Thank you for sharing! I really like Banza. Because of the other benefits (lower carbs, higher protein), I would eat it even if I didn’t have to be gluten-free. Good stuff! I love the dairy free option of this recipe. Thank you! I make my homemade dairy-free cheese sauce and freeze it ahead. It works so well with pasta cooked in the Instant Pot. Looks unbelievably cheesy and the options are super helpful! Umm….yeah, I need to get an Instant Pot! I’ve heard great things! I kept hearing great things but am hesitant to get more kitchen gadgets and appliances. This one is fantastic though and I’m so glad I got it! This is a completely ‘new to me’ gadget! Looks like a great time saver. Your Mac n Cheese looks super! Thank you! Also new to the Instant Pot and can’t figure out why I waited so long to get one. Game changer! I can’t wait to try this! I, too, just got an Instant Pot and LOVE it. I have to admit it scared me at first because the only thing I knew about a pressure cooker came from watching Breakfast at Tiffanys! Needless to say, the Instant Pot is light years away from Holly Golightly’s. I made this with Ronzoni gluten free pasta and it turned out amazing! My daughter loved it, plus she enjoyed helping! Yay! I love hearing all of that! I haven’t seen Ronzoni gluten-free pasta at my local grocery store, will keep an eye out for it. And I’m so glad to hear your daughter was in the kitchen with you. I love those moments! We are trying to go gluten free for my son, but my mother and I are having a hard time with it. That said, this recipe worked pretty well with some boxed pasta we had, made from corn and quiona since he isn’t supposed to have rice either, and it turned out fairly good. I think next time I make it, I’m going to use some chicken stock instead of water since it doesn’t called for draining. I think it will do wonders for the flavor. Thank you. Terrific! I’m so glad it worked for you. I do enjoy using stock or broth instead of water in many recipes, too. Thanks for the suggestion Valorie. I replaced 1/4 cup of the water with chicken stock and it came out perfect. The noodles did foam up a little and spit out the steam release valve but thankfully I covered that with a dishtowel so there wasn’t too much of a mess. I just tried this and it came out great! I used macarona instead of penne and I used one cup of mozerella and one cup of pepper jack (both from Daiya). It’s 100% vegan approved and my non-vegan cheese addicted husband loves it as well! I love hearing it worked well with Daiya. Yay! OMG! I just made this in my IP with Deboles Quinoa and Flax Penne and Cheddar Daiya. It tasted just like the frozen Macaroni and Cheese from Amy’s but there was so much more at less cost. This is going into our regular rotation. DH who can tolerate dairy said it was the best gluten free macaroni and cheese he has eaten. I took Valorie’s advice and researched using chicken stock. Other recipes used 1/4 cup stock and 2 cups water so that is what I did as well. So cheesy and the noodles were the perfect texture (I have had other noodle recipes fail in the IP)! Thank you! Yay! I’m so glad this worked out for you! I make this recipe on almost a weekly basis! I double the recipe and add cayenne, garlic powder and onion powder with the milk for a little zing. Yay! I’m so glad to hear you enjoy it!